WIA members Basetec Services and Guidera O’Connor are playing a significant role in helping one of SA’s most innovative high-tech food projects get off the ground. Basetec was contracted by Guidera O’ Connor for the design, supply, installation and commissioning of NovaFlo 500 GRP seawater inlet and discharge pipe work at the Sundrop Farms Project near Port Augusta – a self-contained solar and desalination greenhouse project that’s setting the direction for food production in the future. The project started with Basetec’s Design and Engineering team completing a comprehensive review of the specification. 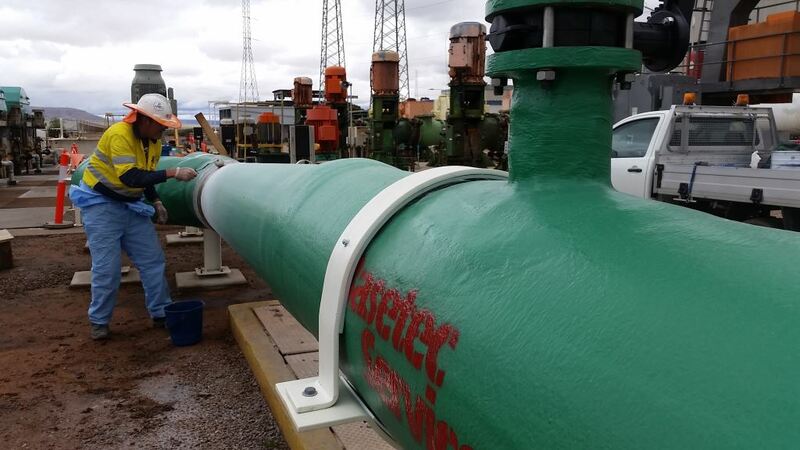 When this was completed, Basetec moved into a detailed design phase to individually design each component for the challenging operating conditions. Each pipe, fitting and spool piece were completely 3D modelled using inventor solidworks design software. Pipe work sizes ranged from DN100 up to DN600. NovaFlo pipe was chosen because of its ability to handle pressures of up to 1600KPa completely unrestrained above ground. The pipes were to be designed to take the full axial loading of the pipeline. The pipes and fittings consisted of several different sizes and comprised of long radius elbows to assist with the pigging requirements of the pipeline. Installation was completed within the eight-week deadline and it was delivered injury and incident free. Basetec worked with tough Australian and International standards (AS3571, BS7159) to ensure a successful project was delivered to a high quality standard. After installation, Basetec’s site crew completed the hydrotesting of all the NovaFlo Pipework that was provided to the project. The Hydrotesting was done in three sections using a digital pressure testing data logger. A detailed report was provided to the client to enable commissioning of the pipelines. Sundrop’s approach to advanced hydroponics is based on the fact that by 2050, rising populations will see a 50% increase in food demand. Climate change is increasing the number and the severity of catastrophic weather events and water scarcity is becoming more acute in arid regions. Sundrop’s technology doesn’t exploit nature, it works in harmony with it, harvesting solar power to supply its energy, hydroponic greenhouses that don’t use soil and water treatment that creates fresh water from the sea or brackish sources to irrigate its crops. All the process needs are sun and seawater to grow food all year around. With no need to rely on the weather or soil quality, Sundrop says its methods provide economic and community benefits, and are better for the planet too.